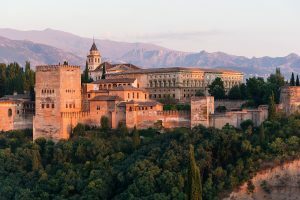 Historical Highlights of Alhambra: Alhambra is situated in Granada in the Andalusia region in the southern coast of Spain, with Seville as the capital, and Gibraltar and Malaga as other important cities of that region. It was under Moorish rule from the 8th-15th centuries. The Moors were the Arab Muslims who originally came from northwest Africa (e.g., Morocco, Algeria, Libra, etc.) and the Iberian Peninsula in the southwest corner of Europe (mostly Portugal and Spain). The Nasrid dynasty was the last Arab Muslim dynasty in Iberia, ruling the Emirate of Granada from 1230 until 1491. Originally constructed as a small fortress in AD 889 built on the remains of Roman fortifications. Then neglected and fallen into ruins during the next 400 years. In 1333, it was converted into a royal palace by Yusuf I, Sultan of Granada. After almost 800 years of Muslim rule and after many battles, Spain including the Andalusia region finally fell to Christian rule with the Christian Reconquista in 1491. When the troops of Queen Isabella and King Ferdinand of Spain laid siege to Granada in 1492, Boabdil, the then and last Nasrid ruler of the Emirate of Granada, decided to surrender. Speculation is that part of the reason he gave up without a fight was to avoid the destruction of his precious Alhambra. Then Alhambra became the Royal Court of Queen Isabella and King Ferdinand, and it was here where Christopher Columbus received their royal endorsement for his expedition. The palace’s architecture was partially altered in the Renaissance style. In 1526 when Spain, Italy, as well as many parts of Europe were under the rule of the Roman Emperor Charles V, he commissioned a new Renaissance palace at Alhambra befitting the Holy Roman Emperor. However, the new palace was never completed due to various rebellions in Granada. 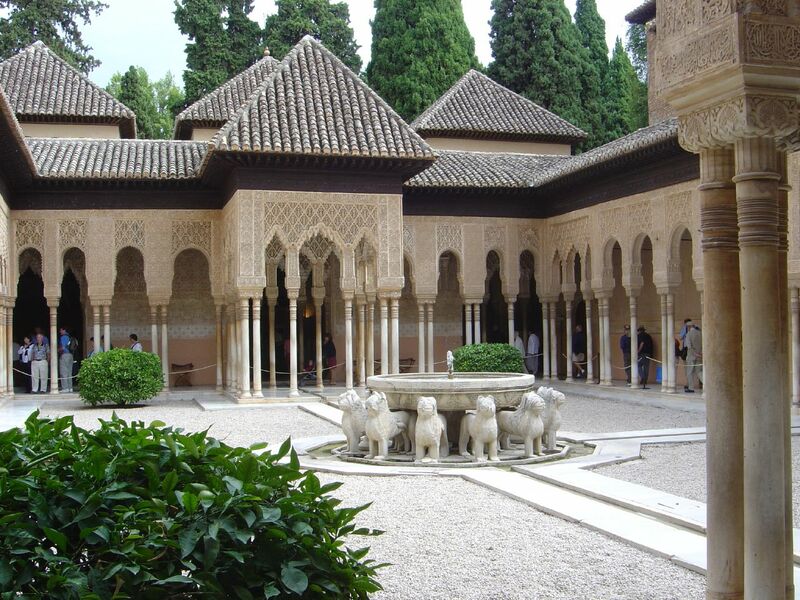 Then Alhambra fell into disrepair for centuries, and the buildings were occupied by squatters. When Napoleon’s troops conquered Granada in 1808, he intended to blow up the palace. The story is that his plans were hampered by a wounded soldier who had been left behind in the palace, who then succeeded single-handedly in diffusing the intended explosion, and thus saved the beautiful palace for posterity. 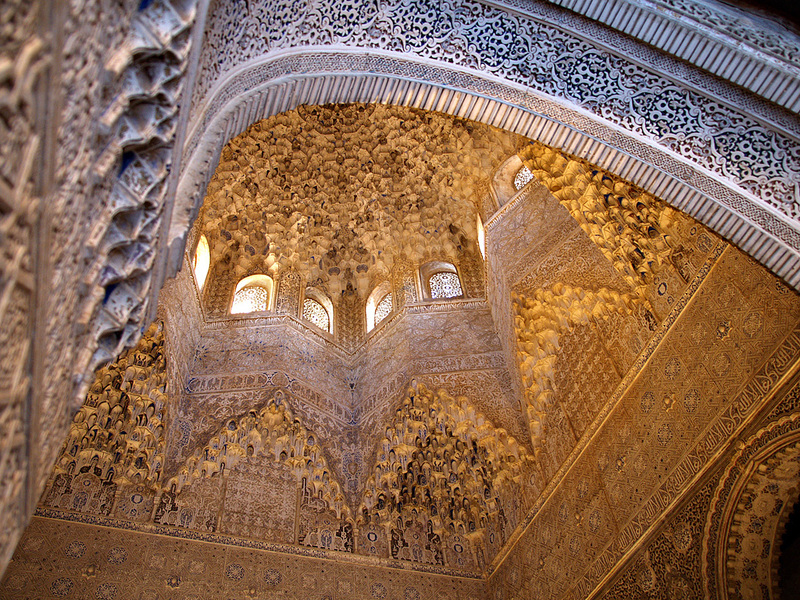 Alhambra was rediscovered by British and other European travelers. 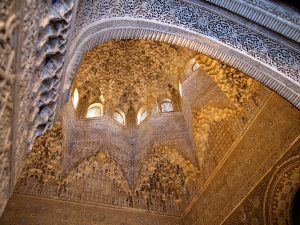 Here one can find Spain’s most significant and well-known Islamic architecture, together with 16th-century and later Christian building and garden additions. Washington Irving’s Tales of the Alhambra helped to popularize it and Alhambra has become one of Spain’s major tourist attractions. 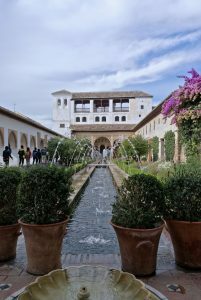 Interesting Facts and Tales of Alhambra: Besides offering beautiful architectural buildings and gardens, Alhambra also has many interesting facts and tales. Here we describe a few. To provide drinking water for the people, including the rulers and their families, living inside the palace, an aqueduct was constructed from outside of the palace to lead to inside the palace. In order to assure that the water is safe to drink, they placed turtles in the aqueduct inside the palace. If the turtles were alive, then the water was safe to drink. To provide added assurance, they asked the soldiers inside the palace to drink the water first. Granada means pomegranate in Spanish. So Granada was named after the fruit pomegranate. There are 613 seeds in the pomegranate, and there are 613 Mosaic laws in the Old Testament. There are a lot of orange trees inside the gardens of Alhambra. They are called mandarin because they were thought to be native and imported trees from China. The general theme of a traditional Islamic garden is water and shade, not surprisingly since Islam usually came from a hot and arid climate. Unlike English gardens, which are often designed for walking, Islamic gardens are intended for rest and contemplation. For this reason, Islamic gardens usually include places for sitting, and is quieter for contemplation. 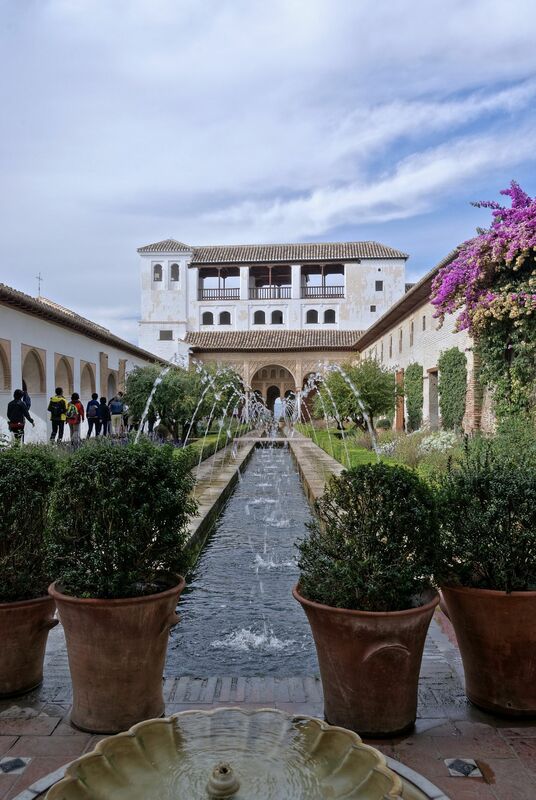 There are two types of water fountains in the gardens in Alhambra: A quieter type that typifies a Muslim garden, and a louder type with water pump that typifies an English garden. There is a story that Catholics take a bath only once a year, because they believe that the body’s dirt helps to prevent infection. This is one of the tales told by Washington Irving in his book Tales of the Alhambra. The story revolves around a poor mason and a rich priest. The priest wanted to build a safe deep inside his house to keep his bags of gold in a secret place. So he hired this poor mason and blindfolded him to take him to his house, and didn’t remove the blindfold from the mason until they were inside the house in a room with a fountain. Then the priest asked the mason to build a burial vault, and asked him to help carry the bags of gold and put inside the vault. Then the priest blindfolded the mason again and took him home. Later the priest died, but didn’t leave any money with anyone. The person who was taken care of the old decaying house of the priest asked the mason if he was willing to take the job with little pay to fix up the house so he can rent it out. When the mason was shown the house and saw the room with the fountain, he immediately agreed to do the job and only asked as his compensation to live free in the house while he was doing the repair. Since he asked for such small compensation, he immediately got the job. So the mason took apart the burial vault and took away the gold. The poor mason became very rich. People frequently heard the sound of clinking of gold coins coming from the pockets of the mason, whereas in the old days of the priest they often heard the sound of clinking of gold coins from inside the house of the priest. Other tales of Alhambra can be found in Washington Irving’s book Tales of the Alhambra. If you are ever in this part of Spain, I highly recommend that you visit and take a tour of Alhambra. Washington Irving actually contributed to the fictional story which is still widely believed even today that medieval Europeans (including scientists and church leaders) believed that the earth was flat, which was not true, because the predominant belief for many centuries before and during the Middle Ages (5th century-15th century) of historians, scientists, and church leaders was that the earth was round. Irving’s writing A History of the Life and Voyages of Christopher Columbus is romanticized biography and is a mixture of history and fiction. He gave a largely fictional account of the meetings of a commission established by the Spanish sovereigns to examine Columbus’s proposals. One of his fictional stories was that the ignorant and bigoted members on the commission meeting in Granada had raised scriptural objections to Columbus’s assertions that the Earth was spherical. The Nasrid dynasty was the last Arab Muslim dynasty in Iberia, ruling the Emirate of Granada from 1230 until 1491. The word “emir” means a Muslim ruler or a Muslim military commander of a region of land known as his emirate. But an emir is usually lower rank than a sultan. A sultan is like the king of a region of land, and an emir is like a military commander of that region of land or a ruler of a part of the sultan’s territory. The Christian Reconquista refers to the period in the history of the Iberian Peninsula of about 780 years between 711 when Muslims first ruled all of Iberia and the fall of the Nasrid kingdom of Granada to the expanding Christian kingdoms in 1491.